Richard Feely has spent years of his career at sea, casting packages of plastic tubes into its void, and pulling up seawater from its depths while exploring how carbon emissions are changing the world’s oceans. 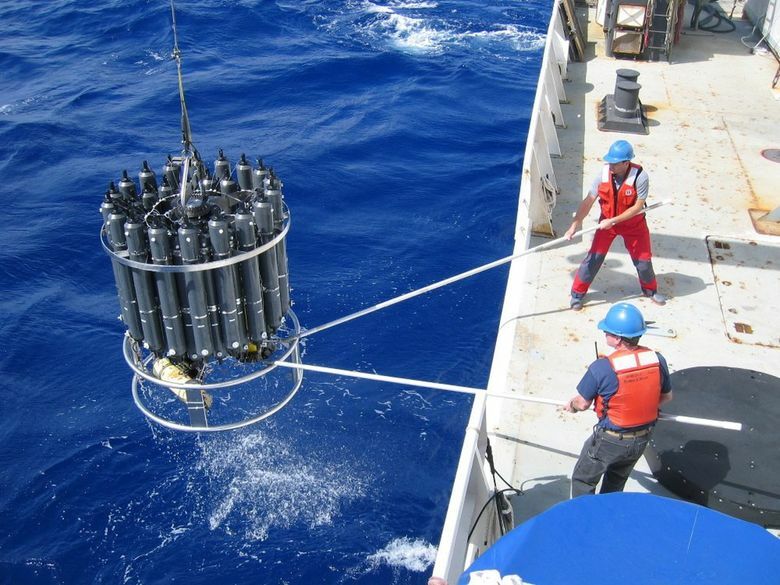 Feely, a senior scientist at the National Oceanic and Atmospheric Administration (NOAA) Pacific Marine Environmental Laboratory in Seattle, has sampled Antarctic waters, passed through Tahiti and ridden out “huge” storms aboard ocean-class research vessels. Most days on these scientific cruises, which last more than a month, there’s no other boat in sight. But the data collected by Feely and other scientists throughout the world are now telling us just how much carbon humans have put into the ocean and what that might mean for our future. New research indicates that acidification of the Southern Ocean will cause a layer of water to form below the surface that corrodes the shells of some sea snails, an outcome that could disrupt marine food webs. University of Colorado Boulder and University of Alaska Fairbanks researchers collaborated on the study, which was published today in the journal Nature Climate Change. Pteropods, a type of sea snail, typically live in the upper 300 meters of the water column in the Southern Ocean. Due to acidification by 2100, they may only be able to thrive on average in the top 83 meters of water. That’s assuming the current level of carbon dioxide released into the atmosphere continues. Last week, I was invited by Congresswoman Lizzie Fletcher (D-TX), Chair of the House Committee on Science, Space and Technology’s Environment Subcommittee, to testify before Congress on the urgency of acting to protect coastal communities from the continued negative impacts of climate change and ocean acidification. I’m pleased to report that the leadership of the Environment Subcommittee is united in acknowledging that climate change is happening and is interested to explore how federal investments in research and development can help us find solutions that both parties can agree on. Addressing the impacts of ocean acidification is a particular passion of mine. It may sound complicated, but even elementary school classes I’ve visited understand—if you add carbon emissions to seawater, the ocean turns more acidic. What is ocean acidification really doing to coral reefs? Recently, researchers have invested a considerable amount of effort investigating the effects of ocean acidification (OA) on coral reefs and specific coral species. Ocean acidification, the lowering of the ocean’s pH due to anthropogenic CO2 input, can have profound impacts on the calcification rate of corals and will only continue to get worse unless we find a way to curb carbon emissions. Corals secrete skeletons of aragonite, a form of calcium carbonate (CaCO3), to grow, in a process called calcification, but this process is energy intensive and the stability of CaCO3 is pH dependent. As pH decreases and acidity increases, oceans become less saturated with aragonite, making it harder for organisms to calcify. Scientists have recorded conflicting responses to acidification for different coral species, including small and large decreases in calcification or no response in calcification at all (Langdon et al. 2005, Ries et al. 2009, Nakamura et al. 2017, Cole et al. 2018, Zheng et al. 2018). All of the aforementioned results confound the understanding of corals to OA. To further complicate OA, there are interactions with other abiotic factors on reefs that can affect coral calcification including temperature, light, and nutrient availability. Together, this convolution makes it difficult, even for researchers in the field, to reconcile the effects of OA on a reef-wide scale and thus tease apart the mechanisms affecting ecological processes. OA is a considerable threat to coral reefs worldwide, but to facilitate management and mitigation we must first understand exactly how it affects these systems. Pry open your first oyster shell, and the vision that greets you isn’t that appetizing. The grey, shiny glob inside looks cold and slimy. But people the world over are obsessed with eating this shelled delicacy. “The most popular way to eat them in Australia is raw,” says Elliot Scanes. He’s a marine biologist at the University of Sydney in Australia. While oysters may be slimy and “have the texture of a booger,” he notes, the flavor is a winner with a lot of people. Oysters, he says, “taste like salty sushi.” And there’s big business in these ocean boogers. In the U.S. Pacific Northwest, oysters bring in $111 million per year. In Australia, where Scanes is a marine biologist at the University of Sydney, it’s $26 million.